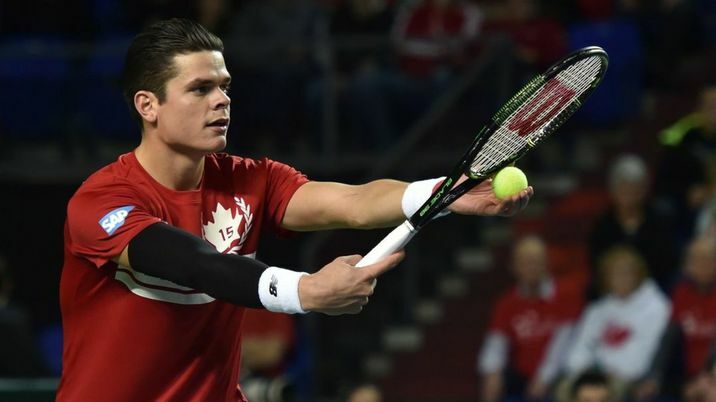 Milos Raonic is once and again Canada’s top ranked men’s singles tennis player. The Thornhill-raised 27-year-old with the bazooka serve is also the only Canadian male to have made a Grand Slam final – Wimbledon in 2016. While he now lives in Monte Carlo, Raonic was back in Toronto last month for the Rogers Cup. He took time out from training to talk about books and reading. Do you take pleasure in reading books? I do. I read non-fiction pretty much exclusively. I feel it’s a nice solace for me. When I’m on the road, reading is one of the best ways to pass time. I struggle with sleep. That’s how I got into it at first. I wanted to read before going to bed because that would get me off my phone, off electronics. Then I found a few books I really enjoyed. Why do you prefer non-fiction? I was raised by two engineers. So, I like having something that’s not too much of a fantasy. I like to be able to connect dots. Whereas sometimes with fiction, especially really out-of-this-world fiction, I struggle with being able to picture it for myself. I didn’t read much growing up at all. That’s the thing. It’s only been the last three or four years that I’ve really gotten into it. I had read somewhere that you should try to read a book a week. That’s really tough for me. The first year I tried to do that, I got to 11 books, which was disappointing because I’m very goal-oriented. Even if I wasn’t enjoying something, I wanted to get there, to that goal. But then last year, I guess as a silver lining, I was injured and had a lot more time at the end of the season. I made it to, I think, 38 books. I tried to commit to it maybe not so much as a goal but more as a pleasure. It’s hard for me to distinguish the two. When I’m on the road, reading is one of the best ways to pass time. When you talk about non-fiction, do you enjoy biographies, for example by athletes? Not so much athletes, more people in other fields. Probably the last book before I really got into reading that I couldn’t put down was Steve Jobs’ biography, which I thought was pretty amazing. I read it on my iPad. If I really like the book I will actually purchase the paper version of it, right after, just to have it with me. I moved into a house that had a lot of shelves. I had this whole fantasy of filling them up with books, things I’m proud of having read. I’ve made some progress, I’m still a long ways away. Any other titles or authors that have stuck with you? Actually, my most favorite, that I was the most emotionally attached to, was Tuesdays With Morrie by Mitch Albom. Somebody recommended it to me. I read it this year. I thought it was so impressive. I've gifted it three times since to people. I want to read his other one, Have a Little Faith. That’s next on my list. What touched you about that book? I think the sort of calmness around everything that we see as so important in everyday life, and tragic if it doesn’t go our way. The simplicity of the things that mattered to him at that point, when he was passing, his connection with other people. I don’t know if it also spoke to me because I was at the end of an injury. I saw every injury as an apocalypse. It was mentally draining and I just wanted to be over it, not to be going through it over and over again. That sort of gave me calm. I thought, yes, it’s not a great situation to be here hurt. But it gave me a re-set – it’s not that bad at the end of it all. I’m an over-thinker. I need something to occupy my mind so it doesn’t go in too many directions. A book’s a great way. You mentioned first starting to read because you were unable to sleep. Is that a chronic condition with you, insomnia? I’m an over-thinker. I need something to occupy my mind so it doesn’t go in too many directions. A book’s a great way. Movies, it has to be really compelling to draw me in, where I can’t get sidetracked. But with books, because you’re going through it on your own, at your own pace, it draws you into it, brings you into that moment. It’s a nice way of staying present, of being in that moment with whatever book I’m enjoying. Do you have a favorite place or a favorite way to read? I read a lot in bed. Sometimes I’ll sit in an empty tub in a hotel bathroom with the shower running. Like it’s just a cozy rainy day and I’m there reading a book. You know how in hotels they’ll give you, like, 10 pillows when you only need one or two? I’ll put them down in the tub. Do you read on planes? I’m not a good flyer. As soon as there’s any turbulence, I’ve got to put the book down and focus on that. I spend a lot of time driving back and forth from the stadium to the hotel, but I can’t read in anything moving, I get nauseous. I started this book that was recommended at a dinner the other night – Red Notice about a private equity guy who was doing well in Russia before the Putin administration, and how things went south for him. It’s based on a true story. Sometimes I’ll sit in an empty tub in a hotel bathroom with the shower running. Like it’s just a cozy rainy day and I’m there reading a book. Do you think you have a book in you? Would you ever consider writing your biography? I like to journal, just for myself. For me to write a book, I think I would be too demanding of myself. Maybe if I could work on it together with somebody, where I could recount the stories. But for me to do it all, that would be tough. I would really struggle putting something out if it didn’t fill the expectations I have for myself. Have you read Andre Agassi’s autobiography? It’s pretty raw. Yeah, I have read that one. I was disappointed. It didn’t leave a good taste about tennis in my mouth. Personally, because I’m so close to it and I really enjoy tennis, I ask, would Andre have had a chance to meet his wife that he’s so madly in love with if it wasn’t for tennis? I didn’t feel like there was gratitude for what tennis gave him. It sounded more as if tennis was a burden to him his whole life, when he could have been doing something else. There was no appreciation for, hey, maybe I didn’t enjoy it so much and I struggled with it, but at the same time look at what I’ve been able to do – I can build my charter schools, I have a beautiful family, all those things. All of that probably wouldn’t have been possible without his incredible experience in tennis. Did you read your former coach John McEnroe’s book? I started his second one. Because I’m so close to him I know all those stories that are in the book. For me to disassociate the person I know from what I’m reading is a little bit tough. But I intend to finish it. I still travel with it. It’s in my suitcase actually. For similar blog content, read The double life of hockey star, Zach Hyman.